Meteorologists were hyping-up the possibility of severe weather on this day for a week in advance. The 6Z day 1 convective outlook from the Storm Prediction Center called for a moderate risk of severe weather in Oklahoma. However, early morning convection and clouds limited the instability in the area, and the moderate risk was downgraded to a slight. Since it was spring break, Valerie and I set aside the entire day for chasing. However, it WAS St. Patrick's Day so we made sure to have a glass of green beer at O'Connell's in Norman before heading out. We left at 2:15 PM and drove south (after sobering up) on I-35, to Pauls Valley, eventually making our way to Antioch. 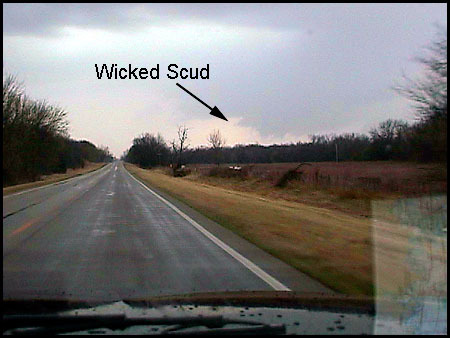 As we approached the town from the north, we observed a wall cloud off to our SW (radar image). As luck would have it (St. Patrick's day, huh?!? 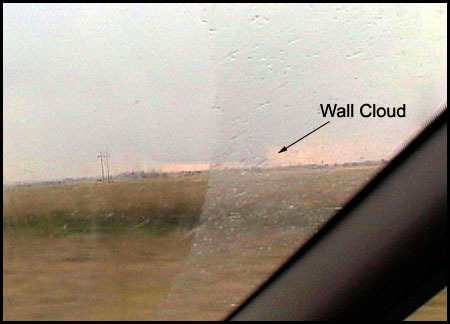 ), the wall cloud began to dissipate as we drove west out of town. We ditched that cell in lieu of a storm to the south, towards Elmore City, that had some wicked scud and a possible wall cloud. We encountered torrential rain but somehow dodged the golf ball sized hail. We then drove NW towards Chickasha and were faced with the typical chase dilemma. A tornado warning had been issued for a storm south of us (east of Lawton) as well as for a storm near Binger, northwest of us. Based on the spotter storm reports at the time, it sounded like the Binger storm had the best chance of "tornadoing." We drove north, to between Union City and El Reno, where we had an amazing view of the mesocyclone and wall cloud off to the west. Although it never did produce a tornado, it offered perhaps the best storm structure either of us had ever seen. We arrived back in Norman at 7:30 PM but the show hadn't ended yet. Half-an-hour later, I drove south to just past Purcell (Wayne, Oklahoma to be exact) where I intercepted another severe storm. As it moved off to the northeast, I was able to capture some great lightning pictures (see below). Click here for storm reports from this day. This includes time lapse footage of the Binger, Oklahoma supercell, the moon passing across the sky, and a cumulus cloud field.